Now that warmer weather is here, it’s time to enjoy some summer food! I love potato salad , especially the way my grandma made it. However I am on this low carb diet , so potatoes are a no no. So I simply substituted steamed cauliflower florets for the potatoes, and did everything else exactly the same. It turned out great and my mom and son said they like it better than the potato variety. Steam the cauliflower till semi firm, drain. Combine all ingredients except for the mayo. Let it sit and marinate for about 20 minutes, then add the mayonnaise . Chill overnight to allow flavors to combine, then enjoy! 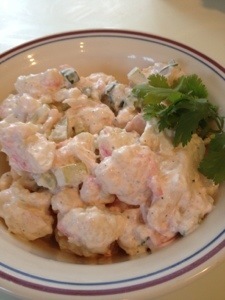 This entry was posted in daily muse, low carb, salad and tagged Cauliflower, low carb, potato salad. Bookmark the permalink.